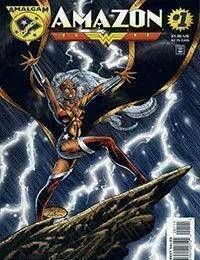 Reared on the island of Themyscira, weather-wielding mutant Ororo Munroe batles the very gods of legend she has been taught to worship! (per solicitation)<br />A vengeful Poseidon attempts to claim the life that slipped through his grasp nineteen years prior, that of Ororo Munroe, a.k.a. Wonder Woman.<br />In flashback, we learn that after being orphaned when Poseidon sunk the ship The Arabian Princess, Ororo was taken in by the Amazons of Themyscira. She was raised by the Amazon queen Hippolyta as one of their own, with Diana as her sister.<br />Ororo won the title of Wonder Woman after she beat Diana in a well-matched contest, which pit Dianas divine powers against Ororos mutant powers of weather control.<br />In the end, Ororo manages to convince Poseidon to let her go.